Well, there is a word for it. tumbao. The Urban Dictionary defines, tumbao, as "An Afro-Puerto Rican word (or African Caribbean...), which means "an indescribable African sexiness or swing." I have always wanted to know what that thing in Latin jazz is: that certain attitude and approach that runs through the body when this music is heard. It is appropriate that this "thing" be defined as, and prove as elusive as, the concept of "swing" in the mainstream jazz vernacular. 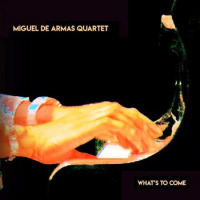 Cuban pianist and composer Miguel de Armas possesses a boatload of this tumbao, which is necessarily nourished by the clave rhythm, genetically driving Latin music. Armas heaps both generously into the compositions making up his release, What's to Come, a slick, contemporary imagining of "that thing" provided us from the Afro-Cuban contributions to music in the Western Hemisphere. What What's to Come is not, is not an exposition of a Bebo Valdes and Chucho Valdes method of playing. North America's re-acquaintance with Cuban music stimulated by the Buena Vista Social Club recordings produced by Ry Cooder was a much more organic experience than is had on What's to Come. Armas ensures that all of the necessary Latin elements are present in his recording while, at the same time, expanding the perimeter of the genre by interpolating elements from adult contemporary jazz and pop. Armas' use of synthesizers alone ensures this palette expansion. Armas displays grace and creativity in his highly-stylized compositions expertly rendered by his band of fine musicians, including, on one cut, soprano saxophonist Jane Bunnett. This is beautifully sophisticated music that is readily enjoyable. Track Listing: Yasmina; A Song From My Little Son; La Dama y el Perro; His Bass and Him; Pam Pim Pam Pum; Illusion; What’s to Come; Rumba on Kent; Tango Asuncion; Freddie’s Drink. Personnel: Miguel de Armas: piano and keyboards; Michel Mendrano: drums and percussion; Marc Decho: bass (2, 3, 4, 5, 7, 9); Arien Villegas: congas (5); Alexis Baro: trumpet and flugelhorn; Roberto Riveron: bass (1); Carlitos Medrano: congas and percussion (1, 3, 5, 8, 10); Mathiew Senechol: bass (4, 8, 10); Galen Weston: electric guitar (4); Jane Bunnett: soprano saxophone (7).